When you can get free Over the Air TV channels, why pay for cable TV? It's no secret that most anyone can receive free OTA channels from Network broadcast TV providers in their area for free. That is unless you happen to live below the shadow of a hill or behind tall buildings that can blocks signals. 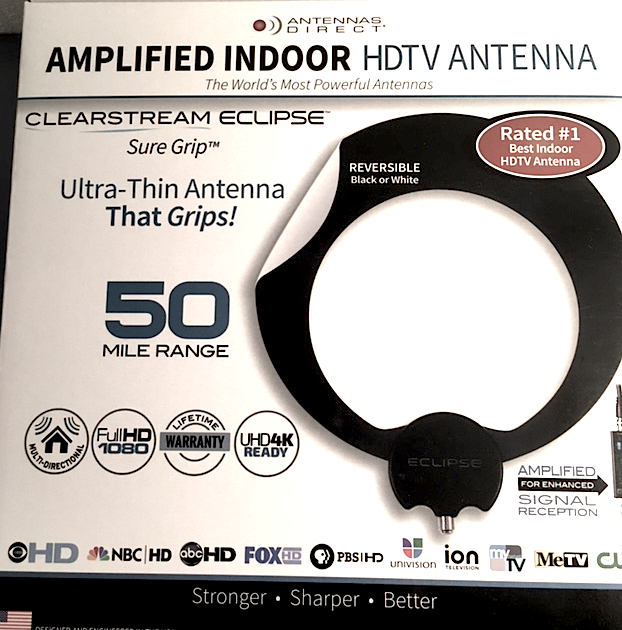 After reading the packaging of Antenna Direct's latest offering the amplified ClearStream HDTV antenna with an advertised range of 50 miles, decided to give this type of antenna another try. Having tried small indoor antennas before and never had much luck picking up any channels indoors was hopeful but skeptical this time it would work any better in our location. The ClearStream is paper thin, it can be stuck to any smooth surface, removed, moved and reused again. It comes with a small electronic signal amplifier module is powered from an included power supply. The small blue LED tells you it's on and working. One F cable output goes to your TV and one input comes from the antenna. The module is clearly marked so you can see which F cable goes where. After hooking everything up and placing the antenna behind the TV and scanning for new channels, not a single channel was received. Disappointed, but not completely surprised decided to hang the antenna over the TV so it could have a clear view of a window where the signals would be coming from and rescanned the channels once again. This time, the tiny ClearStream Eclipse antenna picked up 14 channels which were identical to the ones our large attic antenna received. The antenna in the attic is over 10' long and all this time was really under the impression you needed an antenna this large to be able to pull in anything where we lived. Was completely astonished when the tiny ClearStream Eclipse was able to provide the same exact picture perfect reception from an antenna that was hardly any larger than a phone book in diameter and just a little thicker than a sheet of paper. After leaving the television on and turned to the CBS HD channel, decided to move the antenna to a location behind the TV where it was not visible and immediately the picture went to a black screen. The TV lost it's signal. By moving the ClearStream Eclipse antenna to where just the tip of the antenna was barely visible, the picture came right back again at full signal and once again was crystal clear without pixelation or artifacts. This is something you will notice when a digital signal is right on the edge or weak. This proved to be an important lesson on antenna placement. Never assume just because you do not receive any channels in one location with an indoor antenna that all is lost. Simply moving a small indoor antenna just a few inches can make the difference between receiving nothing at all or many channels perfectly clear. Once the perfect location was found, a simple clear plastic push pin into the drywall served as a perfect hanger for the super light ClearStream Eclipse antenna. This works better on rough drywall than the double sided sticky back Sure Grip hanger which is more suited for smooth surfaces like a glass window. While this ClearStream antenna still could not receive NBC, ABC or PBS from our location. The much larger antenna in the attic was not able to receive these channels either. Receiving these additional channels would require placing a large antenna on the roof and possible using an antenna rotator which means grounding and additional installation headaches. 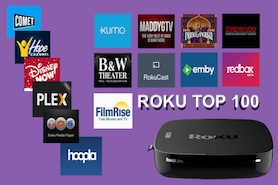 Since we stream almost everything from our trusty Roku 4 and have more content than we need, the extra channels were not worth the added installation headache or having to look at a large ugly antenna hanging off the roof. The Antennas Direct ClearStream HD is a keeper. Now we can use the extra antenna output that was being used by the spare TV as a secondary antenna tuner input to the HDHomeRun Network Tuner which is used to take the over the air Antenna signals and turns them into a digital signal that can be recorded onto a computer. This is used as a Free HD DVR which costs no monthly fees. Isn't cord cutting fun? If you would like to learn more about the new ClearStream Eclipse™ Amplified Sure Grip Indoor HDTV Antenna be sure to visit the Antennas Direct website. Note: Antennas Direct also makes a ClearStream Eclipse HD Antenna without the amplifier, for $20 less with a 25-mile range. This may work perfectly if you live closer to a large city or nearer to the transmitters with nothing blocking your signal. 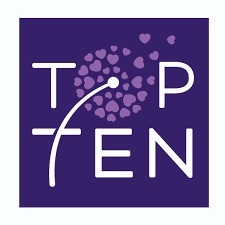 You can check this model out here.